Icinga Web 2 provides localization out of the box - for the core application and the modules, that means that you can with a lightness use existent localizations, update or even create you own localizations. The chapters Translation for Developers, Translation for Translators and Testing Translations will introduce and explain you, how to take part on localizing Icinga Web 2 for different languages and how to use the translation module to make your life much easier. So if there a translation available for the Hello World string you will get an translated output, depends on the language which is set in your configuration as the default language, if it is de_DE the output would be Hallo Welt. To provide a plural translation, just use the translatePlural() function. 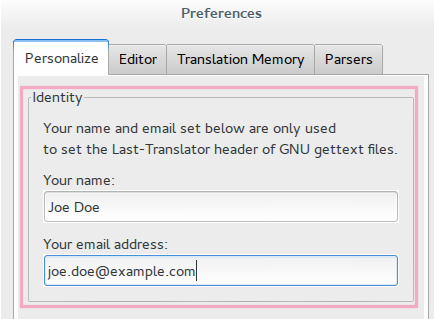 If you want to provide context based translations, you can easily do it with an extra parameter in both methods translate() and translatePlural(). Icinga Web 2 internally uses the UNIX standard gettext tool to perform internationalization, this means translation files in the .po file format are supplied for text strings used in the code. There are a lot of tools and techniques to work with .po localization files, you can choose what ever you prefer. We won’t let you alone on your first steps and therefore we’ll introduce you a nice tool, called Poedit. First of all, you have to download and install Poedit. When you are done, you have to configure Poedit. Personalize: Please provide your Name and E-Mail under Identity. 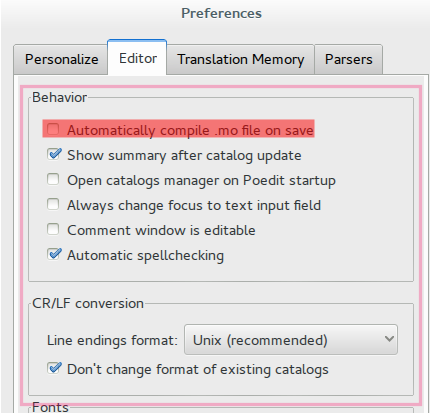 Editor: Under the Behavior the Automatically compile .mo files on save, should be disabled. 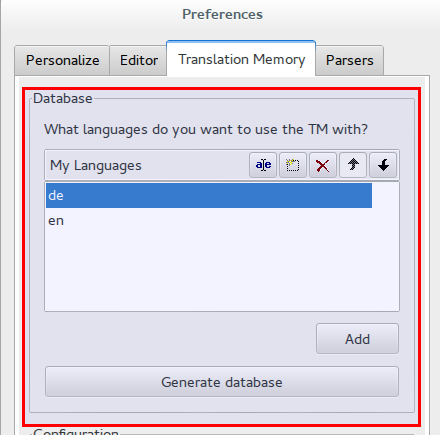 Translations Memory: Under the Database please add your languages, for which are you writing translations. When you are done, just save your new settings. To work with Icinga Web 2 .po files, you can open for e.g. 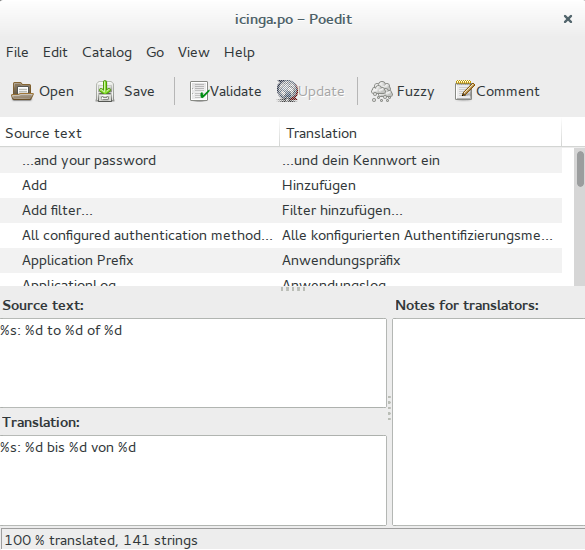 the German icinga.po file which is located under application/locale/de_DE/LC_MESSAGES/icinga.po, as shown below, you will get then a full list of all available translation strings for the core application. Each module names its translation files %module_name%.po. For a module called yourmodule the .po translation file will be named yourmodule.po. Now you can make changes and when there is no translation available, Poedit would mark it with a blue color, as shown below. And when you want to test your changes, please read more about under the chapter Testing Translations. 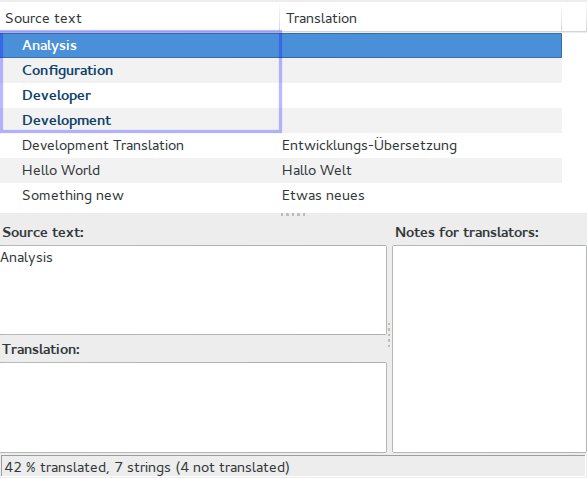 If you want to try out your translation changes in Icinga Web 2, you can make use of the the CLI translations commands. To get an easier development with translations, you can activate the translation module which provides CLI commands, after that you would be able to refresh and compile your .po files. The ll_CC stands for ll=language and CC=country code for e.g de_DE, fr_FR, ru_RU, it_IT etc. After a compile you need to restart the web server to get new translations available in your application. Let’s assume, we want to provide German translations for our just new created module yourmodule. This will go through all .php and .phtml files inside the module and a look after $this->translate() if there is something to translate - if there is something and is not available in the yourmodule.po it will update this file for us with new strings. # Icinga Web 2 - Head for multiple monitoring backends. # This file is distributed under the same license as Development Module. Great, now you can adjust the file and provide the German msgstr for yourmodule. At this moment, everywhere in the module where the Dummy should be translated, it would returns the translated string Attrappe.